The mission of this club is to explain the different cultures within the Middle East. Culture is a shared set of traditions, belief systems, and behaviors shaped by history, religion, ethnic identity, language, and nationality, amongst other factors. The Middle East consists of approximately 20 countries, with many different religions and a variety of ethnic and linguistic groups. Given this diversity, we should not be surprised to find a multitude of different cultures coexisting within the region. The purpose of this club is to show that we are not strange and frightening; we just come from a different culture. There has not been a known situation in which all people were the same. All humans are unique individuals, even within cultural bounds. It’s a fact of life that different cultures have developed. Therefore, people are different from each other – some more than others. And yes, some differences may seem scary; however, if we take the time and effort to get to know one another, we can overcome such unnecessary fears and demolish destructive stereotypes. We are looking for student members from different Middle Eastern cultures and religions. Also, students who are just interested in gaining knowledge about the various Middle Eastern cultures are encouraged to participate. We are showing the variety within our cultures by organizing events and meetings for anyone who would like to share their experiences, knowledge and ideas. We would like everyone to hear our stories about our culture; furthermore, we want to hear about others’ cultural beliefs in order to become more connected at this diverse university. 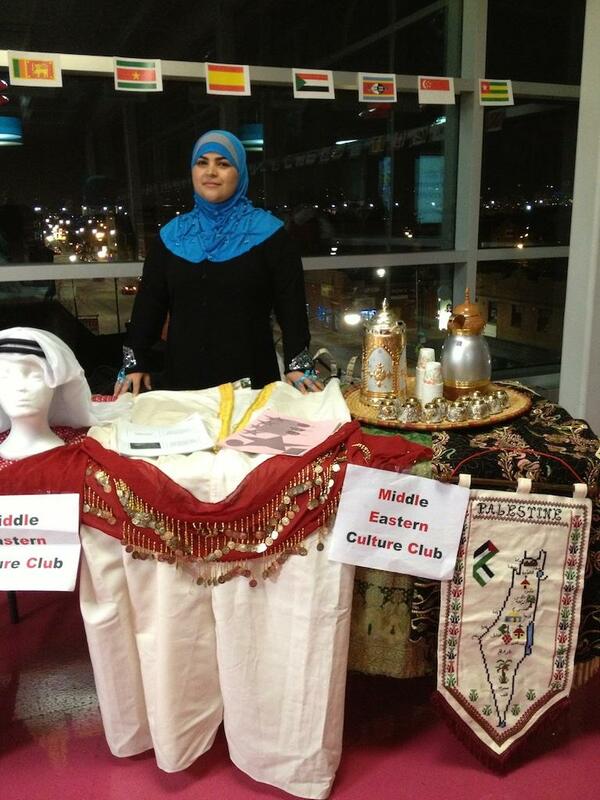 As a social work major, I started the Middle Eastern Culture Club (MECC) in spring 2013. As a wife and mother of four, I also felt it was important to advocate for something I believe in. As President of the MECC I want to continue to advocate for traditional customs and outreach with immigrants. I grew up in Palestine and faced barriers from the culture of society, to believing in education even though it was not accepted for a married woman. When I came to America, my husband supported my goal of obtaining an education. As a Muslim, it is also important to me to break down the fear stereotypes associated with 9/11. I remember hearing stories of harassment afterward and being afraid to go outside. Out of that grew a new awareness that helped me fill the role of an activist. My mission with the Middle Eastern Culture Club is to reach out and to promote cultural awareness. I want to offer solutions that don’t affect faith or spirituality. I want to collaborate with other Muslims and to talk about women’s rights. I want to fight injustices that are everywhere, even in America. Students interested in joining the Middle Eastern Culture Club may find it on neiu.collegiatelink.net, under the “Organizations” tab.